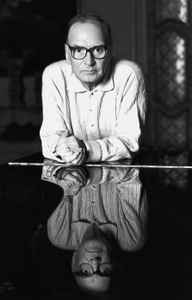 Ennio Morricone (Italian pronunciation: [ˈɛnnjo morriˈkoːne]) is an italian composer (born 10 November 1928, Rome, Italy). A favourite pupil of Goffredo Petrassi, he also deputized secretly for his trumpeter father in a light music orchestra. He thus developed two distinct sides to his musical personality: one of these led him to embrace serialism and the experimental work of the improvisation group Gruppo di Improvvisazione Nuova Consonanza; the other gained him a leading role, principally as an arranger, in all types of mass-media popular music, including songs for radio, radio and television plays, and the first successful television variety shows. Truly a living legend.this man's music has permeated all of our lives even though we may not even realise it.for me,the best composer of all time. Every piece of your music got directly into our hearts.